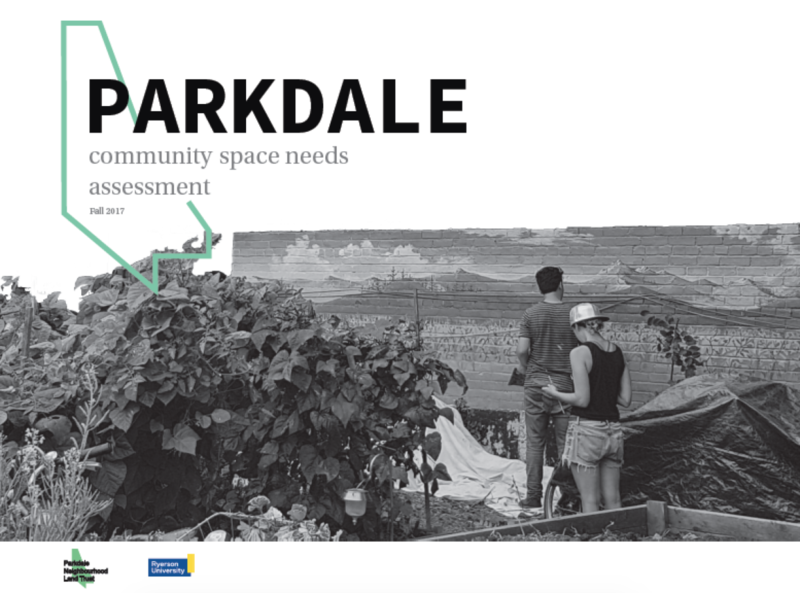 We invite all non-profit organizations in Parkdale / Ward 14 to participate in the 2017 Parkdale Space Needs Assessment. This survey has been developed in partnership between the Parkdale Neighbourhood Land Trust (PNLT) and Ryerson University’s School of Urban & Regional Planning. Initial invitations to respond to the survery were sent to local organizations on October 23rd and survey responses will be accepted until November 06th 2017. The needs assessment survey aims to understand the space needs and assets of non-profit orgnaizations within the community. We will use this information to identify challenges that your organization and others may be facing in the wake of pressures that have significantly impacted the affordability of space within the Parkdale neighbourhood. The information gathered will be used to potentially connect you with opportunities within future developments, where your organizational needs, as indicated, could be better met. The survey results will help guide future neighbourhood investments, as well as equip community agencies with accurate data and analysis to engage with the City, developers, the real estate sector and potential funders. Please note that the information shard within this survey will be accessed by the Ryerson Research team, the Parkdale Neighbourhood Land Trust, Parkdale Community Economic Development partners, and City of Toronto Staff. This survey will take approximately 30 minutes to complete. The process will be simpler if you have the supporting documents and figures listed below readily available. We encourage you to schedule time to complete this survey. you will need on hand. If you wish to complete the survey in more than one sitting, you can skip to the end and click Submit. You will receive a copy of your responses to the email address you provided, along with a link to ‘Edit Response’, which will allow you to make changes to your responses until the survey closes. The survey will be closing on November 6th, 2017 at 5pm; please ensure that you have submitted your full form by this date. In order for all of your responses to be collected you must go to the end of the survey and click ‘submit survey’. This will demonstrate your full consent to participation. Should you need assistance with the survey questions, or if you would prefer a paper copy of the survey, simply email parkdale.spaceneedsassessment@gmail.com with your request.